Garden Update- including a greenhouse! | I, Sarah, Take you. Garden Update- including a greenhouse! It’s certainly been a while since a garden update. My indoor garden started off as an awesome success. Unfortunately with our winter extending longer than normal and some places even getting snow into May, my ability to get the plants outside with natural sunlight slowly faded and so did some of my plants. I was able to convert my beans and peas into larger pots and they did okay for a bit until the starving animals found out there location. Dan and I have a pretty strong desire to grow our own food. Living in town doesn’t exactly give us a huge opportunity to have a large garden. Also, the majority of our backyard is composed of sand and covered up brick paths from when the house was originally built and the paths were for the horses to be escorted into the bottom half of the garage. A very cool historical fact, not so great when you are trying to plant things into the soil. Dan suggested that we buy a greenhouse to put out the back of our house. We headed to Menards this past weekend and picked one out. 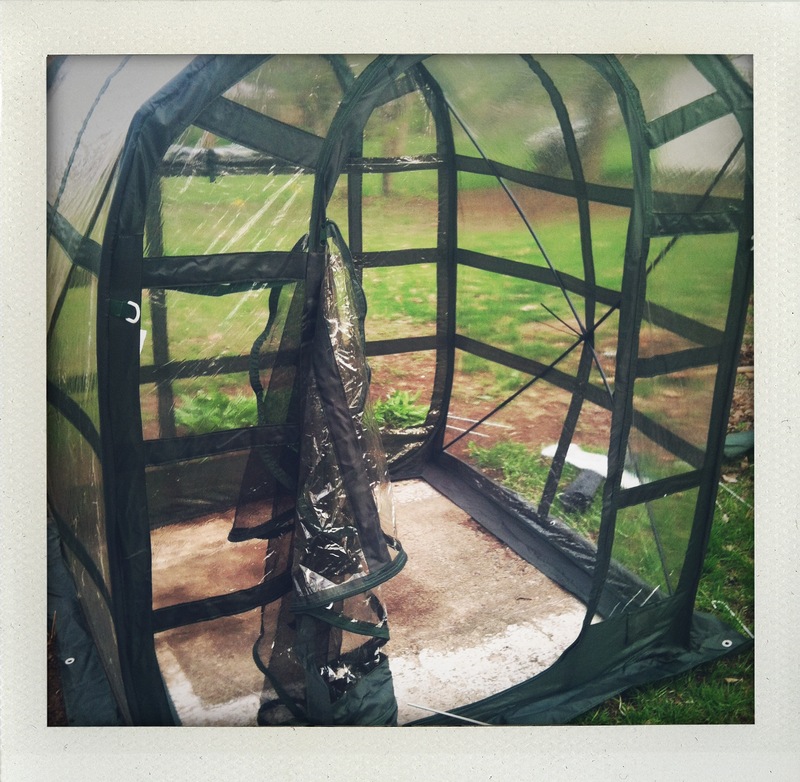 Based on what we were looking for, we went with a 5′ X 5′ greenhouse made out of the harder plastic. With the harsh winters, it’s best that we are able to take it down once the snow starts piling up. We have a cement slab in the backyard that we decided we would use to stabilize the greenhouse and make sure it was even. I’d like to say that I contributed to putting this up but being 8+ months pregnant I offered my ideas and walked around it checking it out as it took shape. The worst part, was putting the stakes into the ground, as explained before, there are bricks and stones underneath the soil making it a big difficult. Up and ready to go!